The weather has been fairly miserable today but it cheered up a bit later in the afternoon so we met my sister at the park with the kids and their bikes. 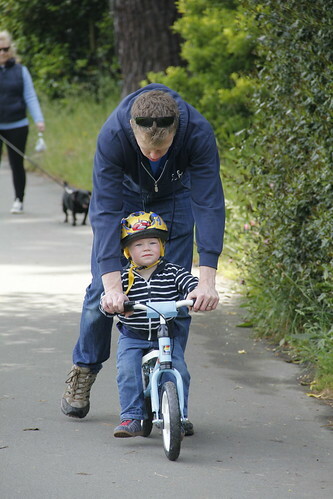 We gave The Little Mister this lovely balance bike for his birthday in December last year although he is only just tall enough to start using it now. He is a little reluctant to actually propel himself forward but I think he will pick it up soon. He is such a little character and made us laugh a lot by calling my glass of wine ‘Mummy’s vitamins’ at teatime. Funny boy. I do love him so very much. 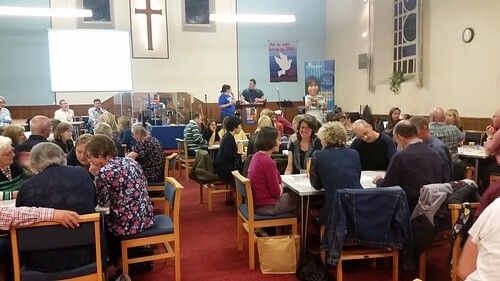 This evening we went to a quiz at my Dad’s church which was to raise funds for Mum’s legacy project in Burkina Faso. It was brilliant and really well organised at they raised about £700 for Compassion UK which will make such a difference and will change many children’s lives. Of course I should mention that the quiz was a close run contest and it came down to the tie-break question. ‘How many miles as the crow flies it from here to New York’. Our team won it, getting this question right to within 200 miles. Hurray! 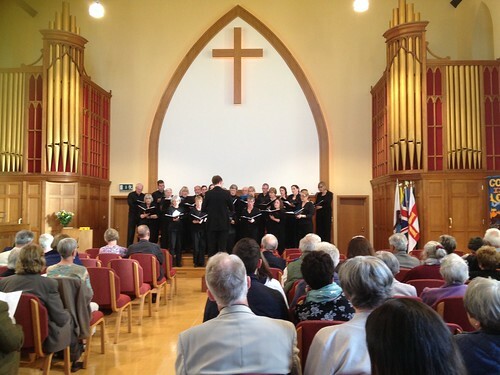 Tonight I was singing with the choir, Bel Canto, at a concert at one of the local churches. We were joined by a very good choir from Southall Minster. It was a good concert and I saw two of my old Headmasters, one from primary and one from secondary. They seemed to both think I was a bit naughty at school! Surely not. 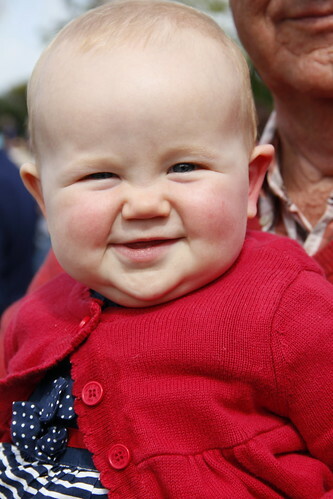 I cannot believe that this beautiful girl is 10 months old today. She has been quite grumpy today but that is because she has a horrible cold and she sounds like a baby warthog! We love her so much, and I love to see how she and The Little Mister relate to each other. He completely adores her, and you can just see when she looks at him that her eyes light up. She has brought such joy and pleasure to us. Our beautiful and funny Little Miss. This morning my sister looked after the kids whilst I went to work. 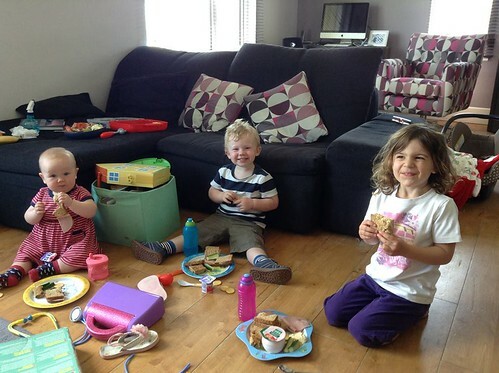 I think they were quite well behaved, but as I had forgotten to pack the travel high chair they had to have a picnic in the lounge. The Little Mister looks pretty pleased with this dining arrangement. 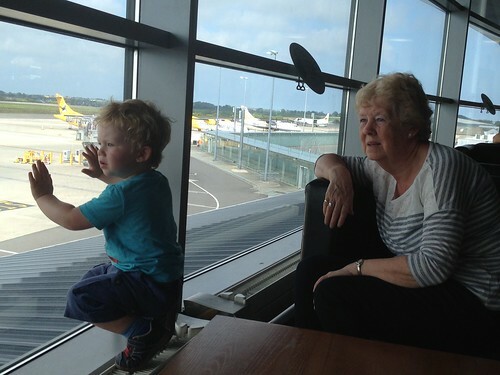 Today Grandma and Grandad flew back to Manchester-land after a lovely few days together. This meant a trip to the airport for The Little Mister which is about as good as it gets! The Little Miss is absolutely desperate to get crawling and she gets as far as pushing herself forward onto her leg but then she gets her leg stuck. 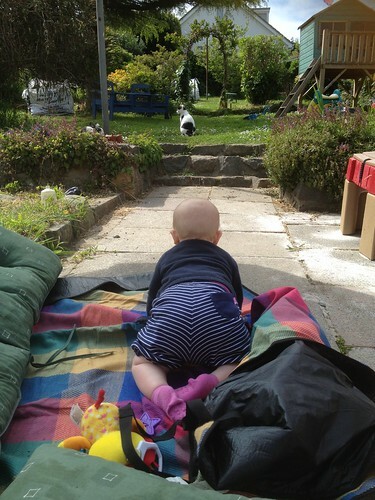 I thought she was going to manage it today in the garden when the cat was in the distance taunting her. I think poor Mabel might be in for a nasty shock when she gets mobile! I was going to do this picture last night but The Little Miss decided that she wouldn’t go to bed until 10.15pm so I ended up taking her to bed with me. Maybe I should rename her The Little Madam! We had a nice day yesterday of wandering about the town for Seafront Sunday, lunch at The Rockmount and then a bit of Grand Prix watching at Dad’s house. 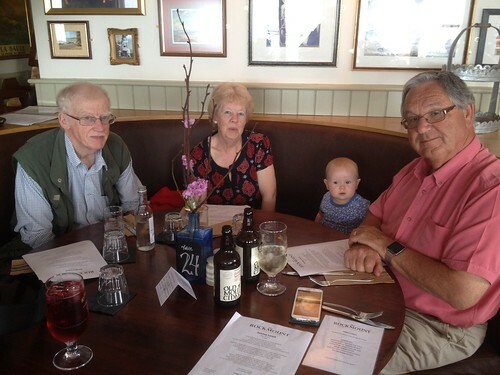 Here is The Little Miss holding court with her three slaves… I mean the three doting grandparents! The Mister is out with his parents at a folk gig, and unfortunately I had to stay in with the kids. There is a bonus though. It’s Eurovision. I have completed all the ironing. 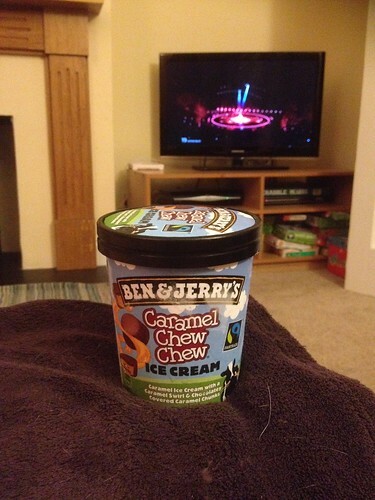 Now, me and Ben and Jerry are going to snuggle up and get acquainted! OK, I know this doesn’t look like the most beautiful plate of food you will have ever seen but it is absolutely delicious! 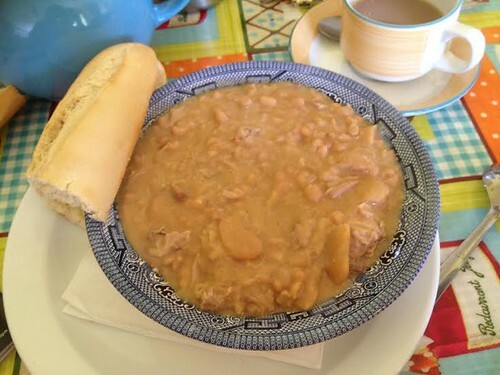 This is Guernsey Bean Jar and it is a bean and pork stew. Thick and meaty it was traditionally put in the bread oven overnight and eaten for breakfast. Several places on the island serve it, but Cobo Tea Rooms makes one of the best ones!